The first satellite to orbit the planet — Sputnik 1 — may have burned up and come back to Earth but thousands of other pieces of detritus remain circling the planet, including Vanguard I, which was launched by the US Navy in 1958. "There are around 20,000 objects in orbit, but only seven percent of those are active, such as the International Space Station. Some of them are the size of a soccer ball but others can be extremely large with a span of 30 metres or more. Most are one or two metres in diameter but there are some big beasts out there," Dr. Holger Krag, head of the European Space Agency's Space Debris Office told Sputnik from his office in Darmstadt, Germany. ​Amazingly they very rarely collide with each other. On 10 February 2009 a commercial US telecommunication satellite, owned by a firm called Iridium, was destroyed when it collided with a defunct Russian Cosmos satellite. Both were travelling at around 25,000 kilometres an hour. "We still don't know why they collided. There is no formal space traffic management. There is no space law but there are guidelines and there is good collaboration between all the larger space-faring nations — Russia, India, China, the ESA, NASA," Dr. Krag told Sputnik. A Japanese company has launched a satellite that will drop tiny balls through the atmosphere to create "artificial meteorites". I'm on the fence; on the one hand it might be inspirational, but on the other, it could be considered light pollution/space junk. What do you think? ​There are a number of different orbits around the Earth. The highest orbit — 35,000 kilometres from the surface of the planet — is what is called the geo-stationary orbit. The satellites placed there circle the planet once a day and provide television signals, weather reports and telecommunications services. This is a distance one-tenth of the way to the Moon but 300 kilometres beyond it is what is known as the "graveyard orbit", where geostationary satellites which are being taken out of action are supposed to be moved so they can break up without damaging other live satellites. 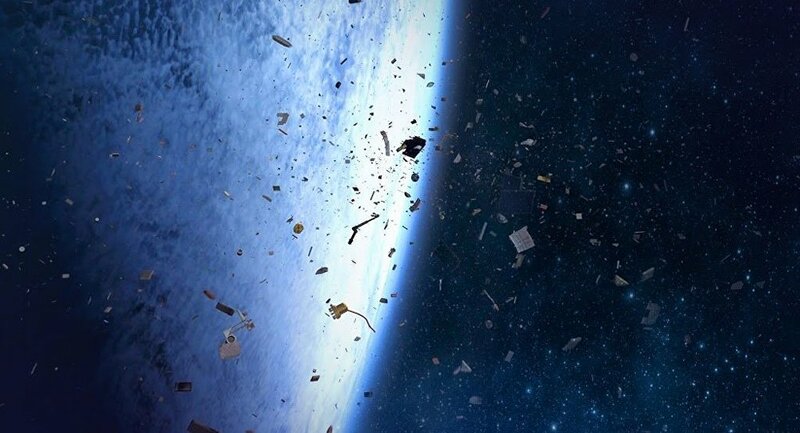 But the majority — more than two-thirds — of space junk is in a much lower orbit, less than 2,000 kilometres above the Earth. It contains mainly Earth observation satellites, which include scientific and climate monitoring satellites and CubeSats, tiny objects designed and built by universities to support academic learning and research. ​Nowadays there is a protocol which is supposed to ensure that satellites which have served their purpose are brought back to Earth, either burning up harmlessly in the atmosphere or crashing into oceans like the South Pacific. But often they malfunction and continue orbiting, stubbornly ignoring on-board or remote orders to return to dispose of themselves. "Destroying them with lasers would make things worse. It would create more debris. One of our jobs is to make sure our fleet of craft is safely orbiting and avoiding debris. However we can also track objects using precise laser and we are working on a system that would predict their position with high accuracy. That would be a map updated every hour," Dr. Krag told Sputnik. He said in some cases it was possible to trace back an object and work out exactly what it had been before it became space junk. "But you don't really care what it was as long as you don't collide with it," Dr. Krag told Sputnik. "Space is not partitioned. It's not like shipping lanes. You constantly monitor the traffic next to you and you have to watch out every day for any risk of collision. We make avoidance manouevres," Dr. Krag told Sputnik. ​He said there were no "rogue" countries deliberating ignoring space protocols. "I can't say there are no black sheep. But you pollute space globally so when you do something wrong it affects everybody and everybody understands that," Dr. Krag told Sputnik. The ESA is also proposing a mission, called e.deorbit, which would capture bits of space junk in a giant net and then burn them in re-entry. The European Space Agency, which was founded in 1975, is not related to the European Union. "Britain will remain in the ESA after Brexit. It's an independent organisations. We have many members who are not in the EU, including Norway and Switzerland. Canada is an associate member," Dr. Krag told Sputnik. The ESA — which currently has a fleet of 20 craft — launches most of its satellites from the giant Spaceport near Kourou in French Guiana, although they occasionally use Russian or even Indian launch sites. Matt Desch, the CEO of Iridium, said before the 2009 collision the company had no "actionable data" with which to move spacecraft when they were forecast to have a future collision with another spacecraft. "The error bars were so large that any action we could take could actually make the situation worse, rather than better. So, we never moved a satellite prior to the 2009 collision," Mr. Desch told Sputnik. "After the collision, we immediately began working with the US Combined Space Operations Center who provide us much more accurate data on space debris, and we developed a coordinating regime where we would share information about possible conjunctions and satellite movements so possible conjunctions could be predicted with high accuracy. As a result, we will now move satellites regularly. They don't need to be moved very far, and the movements don't affect our service. We are adjusting a satellite's position on the order of about once a week to ensure our they are safe," Mr. Desch told Sputnik. "We have also been aggressive about deorbiting our first generation satellites that are approaching 21 years in age. We've deorbited over 50 of the 66 satellites, and the remainder will be deorbited in the next few months after we complete our Iridium NEXT technology refresh," Mr. Desch told Sputnik.